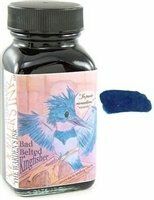 Noodler's Ink is 100% made in the USA from cap to glass to ink. Archival quality inks in large 3oz. bottles for vintage or new fountain pens. Bad Belted Kingfisher is Bulletproof, Eternal, and Water-resistant. It is also one of the most advanced fraud resistant inks in the world with component variations per bottle. If you have any questions about this product by Noodler's, contact us by completing and submitting the form below. If you are looking for a specif part number, please include it with your message.